This is plate 4 from James Fergusson's 'Ancient Architecture in Hindoostan'. 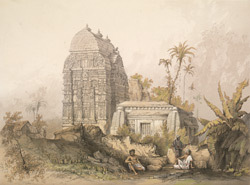 Fergusson wrote that this temple in Bhubaneshwar was "of a type and form very rare in India." His information on its origin and date was sparse and he was unable to revisit it as he intended. His sketch appears to be of the Vaital Deul, with a rectangular sanctuary covered by a barrel-vaulted roof (of the type known as khakhara deula, or pumpkin tower) topped by three miniature amalakas. Probably built in the 8th century, the temple's name may derive from the 'vetalas': spirits worshipped in Tantric practice. The adjoining rectangular 'jagamohana', or porch, has miniature shrines in its corners and a roof of sloping slabs. It is dedicated to a form of the goddess Kali known as Chamunda, whose terror-inspiring image is surrounded by other horrific forms in the sanctum.